Investment in Australian VW production has now totalled £14 million. The Clayton facility is now 365,000 square metres in size. All 1,007 body panel components for the Beetle are now stamped in the press shop, the third-largest in Australia. The press shop contains 40 presses, from 60 to 1,800 tons capacity. The press hall has two overhead cranes of 25 and 50 tons with a clear span of 38 metres, 27 metres above ground level. The nearby engine assembly shop opens, assembling engines from local and imported parts. Also now completed and operational is VW Australia’s new quality assurance and testing laboratory, the first of its kind in Australia. The automatic paint shop features Australia’s only total immersion fully-dip bodyshell protection process and dust free automatic paint line. VW is the only Australian manufacturer to apply a baked enamel finish, in contrast to the nitro-cellulose lacquers used by the other makers. Clayton has the world’s first oil-fired radiant heat paint drying ovens. Holden and Ford would not upgrade to VW-style baked enamel until the 1990s. The body-in-white and chassis assembly lines are serviced by a 2,100-metre overhead conveyor system, which also serves for parts storage. 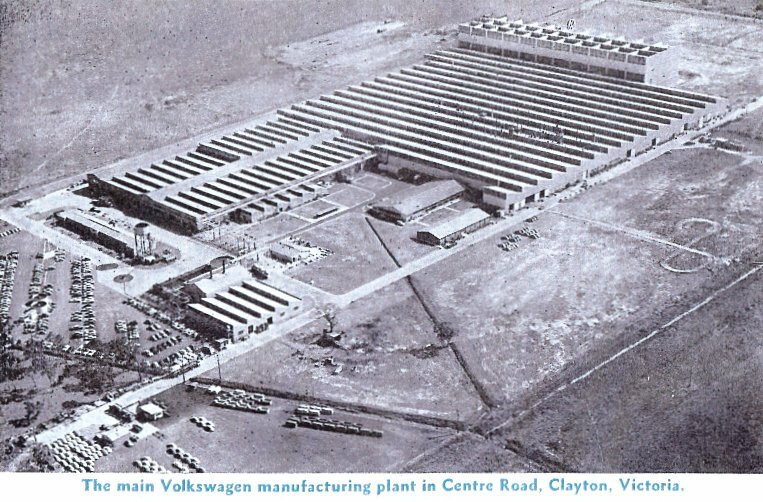 VWs are now coming off the Clayton production line at a rate of 120 per day. Volkswagen (Australia) Pty Ltd is granted a £335,000 import duty refund by the Federal Government's Tariff Board. This was for duty previously paid on imported body panels that could not be sourced locally at the time, but in future would now be made in Australia. The duty refund applied to panels (not exceeding 35,000 sets), imported for the Volkswagen sedan during the period 1 July 1958 to 30 June 1960. Cabinet had been split on the decision but followed the advice of the Tariff Board. The Customs Department and General Motors-Holden both opposed the decision, while Chrysler and BMC were in support (they also received similar tax refunds for their own imported panels). LNC Industries formes a new division called Ruslit Motors to sell and service VW Industrial Engines, as well as other industrial and marine engines from Perkins; Magirus-Deutz trucks, and commercials from the Rootes Group (Commer and Karrier). Ruslit Motors replaces ‘LNC Trading Co Ltd’. A new site on Parramatta Rd Auburn is purchased for new sales, and the Balmain site reverts to spare parts and service. March updates include adding a front anti-sway bar and steering damper, and softer torsion bars at the rear to improve the ride. The front seats are reshaped, with the seat sqaubs now curved. 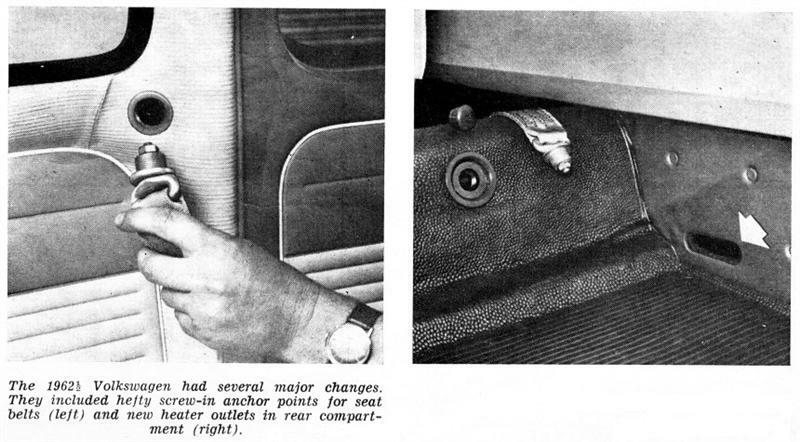 The passenger now gets a sloping footrest. Sound deadening is improved, and the paintwork is now baked enamel. The semaphores and wipers are now self-cancelling. In June the old B-pillar semaphores are replaced by flashing blinkers on the front and rear guards. The rear lenses are special small, oval-shaped half-amber half-red units originally designed for the Italian market, and not used on US/UK-spec models (or in any other market). 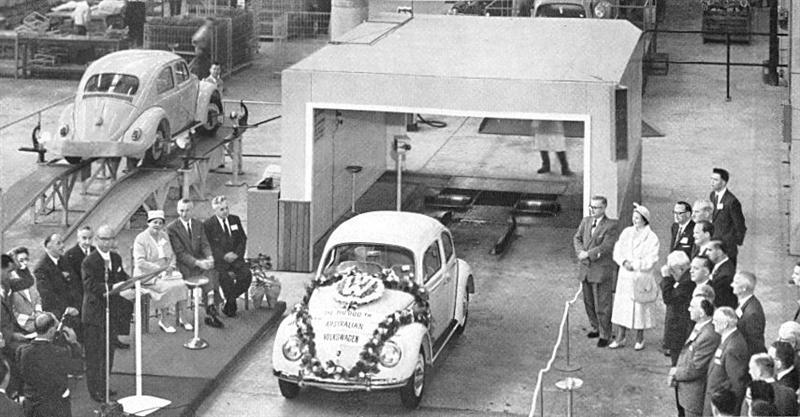 On 18 October Lanock Motors launches the redesigned ‘EA-106’ VW at the Coogee Bay Hotel in Sydney. The new model includes the redesigned 1192cc 40-bhp engine and all-syncromesh gearbox. Other additions are padded sunvisors, passenger grab handle, automatic choke, redesigned fuel tank and larger front boot, suction pump windscreen washers and asymmetric headlamp lenses for high-beam dipping. Four VWs are entered at the first-ever Armstrong 500 motor race for production cars, held at the rough 4.45 km circuit at windswept Phillip Island in Victoria. There are five classes, A to E, based on engine size. The best VW was Ken Orrman and Max McPherson, fifth in Class B (751-1300cc) behind three Simca Arondes and a Triumph Herald, and 14th outright. Two other VWs finished - David McKay / Greg Cusack sixth in class, and Arthur Wylie / Ken Wylie seventh in class. The fourth VW of Eddie Perkins / George Reynolds did not finish, running out of petrol in the final laps. The race was won by Frank Coad / John Roxburgh in a Vauxhall Cresta. Four Australians win the ‘VW Badge of Honour with Diamonds’ at the annual Commendation Day at the Volkswagenwerk in Wolfsburg. These include Bruce Gartrell (Lanock Motors Sydney); Harry Glenney (Light Motors, Adelaide); Gordon Newman (Spencer Motors, Melbourne) and Clive Sainsbury (Western Motor Co, Perth). Five more Australians win the ‘VW Gold Badge’ – Alan Evans (Annand and Thompson, Townsville); Peter Knight (Lanock Motors, Sydney); George Manley (Spencer Motors, Melbourne); Ed Martin (VW Motors, Brisbane) and Tim Tracey (Lanock Motors, Sydney). The first ‘all starter’ interstate motorkhana is held between the three major VW clubs then in existence – VIC, NSW and SA, at Bacchus Marsh in Melbourne. The Victorians win the event. 1960 would be the Beetle's most successful ever year in Australia, with its sales of 24,388 never beaten again. For this year only – before the introduction of the Mini 850 and with only 4 months of the new Ford XK Falcon - the VW 1200 Beetle is Australia’s second-best selling individual car model, second only to the FB Holden. Volkswagen is still third overall in the car market, only 6,000 behind Ford (which also sells the Anglia, Prefect, Consul, Zephyr, Zodiac and Customline). VW sells more cars than 4th and 5th-placed Morris and Austin combined. 28,597 Volkswagens are sold – 24,388 VW 1200s, 264 Karmann Ghias and 3,945 Transporters. Australia is hit by a recession and credit squeeze, which affects all car manufacturers. Volkswagen (Australiasia) Ltd's managing director, Allan Gray, explained that the company has dismissed 90 production workers due to the downturn. "We have been forced to cut our staff because of the effect of the credit restriction on the sale of new vehicles," he said. "We hung off as long as we could, in the hope that the situation would be relieved, but we have been forced to follow the other automotive companies and retrench." Volkswagen was mentioned in federal House of Representatives in April, when the leader of the Labor opposition, Mr E.G. Whitlam, mentioned that the remaining 49% of Volkswagen (Australasia) Ltd shares were recently acquired by the German parent company. The Volkswagenwerk had earlier bought the shares owned by Clyde Industries Ltd., and had now purchased the shares previously held by Regent Motors (Holdings) Ltd., Melbourne, and LNC Industries Ltd (Sydney). 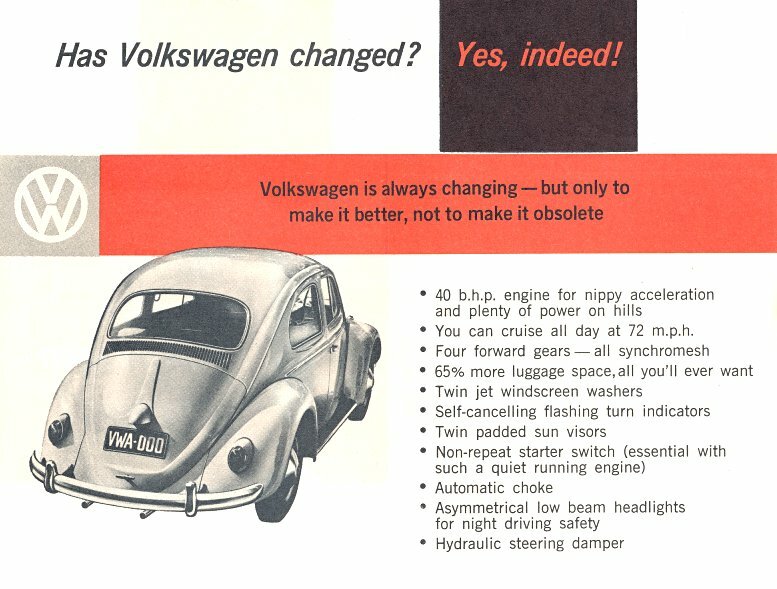 This made the Australian Volkswagen company now 100% owned by its German parent. "Has the Government been consulted about the transaction?" Mr Whitlam asked. "Is there any prospect for exports by the car industry, since all the substantial manufacturers were now wholly owned overseas?" In reply, the Federal Minister for Trade, Mr J. McEwen, said that he did not know whether the Government had been consulted, but he could see no reason why it should have been. He also said he did expect an increase in car exports soon. The 100,000th Australian Volkswagen is delivered. In a ceremony at Clayton to mark the event, the Premier of Victoria Sir Henry Bolte presents Mr and Mrs Hanael (owners of Australia’s oldest VW) with the brand-new 100,000th VW, in exchange for their 1946 model. Volkswagen Australasia had searched for ‘Australia’s oldest VW’ for four months, with the help of extensive advertising and dealer enquiries, before finally locating Mr and Mrs Hanael in country Victoria. VWA was to use the ’46 for display and promotions for a number of years, until it was sold in 1984. It spent some years at Green’s Motorcade Museum at Leppington in Sydney, then at Gilltrap’s Museum in Queensland. Today the Haenel’s 1946 VW can be seen in the York Motor Museum in WA, home of the Peter Briggs collection of over 150 veteran, vintage, classic and racing cars. Meanwhile Ted and Therese Haenel used the 1961 100,000th for years afterwards, driving it every day and going on numerous driving holidays. Ted eventually became too old to look after it and he donated it to a friend. Therese passed away in 1980, Ted in 1982. Their son Bruno and his wife Jadwiga continued to live in Horsham. Bruno passed away in 2011. In May 1961 Melbourne’s Spencer Motors imports a batch of fifty German-made Beetle Cabriolets for Australian sale, and displays a couple at the Melbourne Motor Show. Local magazine tests were positive, especially noting that German build quality was only slightly better than Australian. But public reception is cool due to the much higher cost, and also the unfortunate timing of the display in the middle of a Melbourne winter. Plans to release the expensive imported Cabriolet are shelved, and it was never offered for Australian sale again. However, the Melbourne factory does offer a ‘sunroof’ version of the Australian-made Beetle. Only one VW is entered in the Armstrong 500 at Phillip Island this year, when total entries drop from 45 to only 26. The sole VW, driven by George Reynolds and Greg Cusack, finishes fifth in the 1000-1600cc Class C (and 14th overall), behind three Peugeot 403s and a Simca. Bob Jane won the race in a Mercedes 220SE. The Volkswagenwerk no longer includes other countries in their annual Commendation Day awards in Wolfsburg, instead delegating the task to the local VW subdivisions. In Australia, the annual ‘Commendation Day Awards’ commence at the Clayton headquarters. Managing Director Allan Gray presents ‘Golden Badges of Honour’ and ‘Honour Badges with Diamonds’ awards to 12 Sales, Service and Spare Parts representatives from the eastern states. A similar ceremony is held in Perth for WA staff. Late in the year the Beetle got a locally-made VDO electric fuel gauge, not the mechanical one fitted to US-spec VWs. The VDO electric fuel sender in the tank is connected to the gauge by a brown wire, the only instance of a non-earth brown wire in the VW. US-style ‘deluxe’ towel-rail overrider bumper bars are fitted as standard. Volkswagen (Australasia) Pty Ltd releases a survey of the most popular paint colours for Australian Volkswagen customers. White is the most popular colour, with 25.6% of buyers in our hot country. Second was Turquoise (21.2%), and third was Grey (15.3%). Fourth was Green (14.1%), followed by Blue (11.4%), Ruby Red (6.8%), Yellow (3.8%) and Black (1.8%). Interestingly, a similar survey by VW of America provided almost identical results – except for Ruby Red, favoured by 20.6% of Americans, three times more popular than in Australia. The harsher Australian sun must have made red more unpopular than in the cooler US. 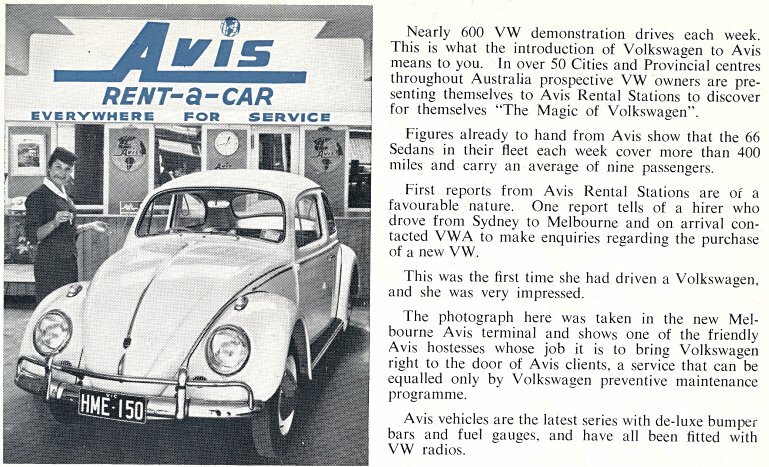 The Avis rent-a-car company purchase a fleet of 66 Volkswagen 1200 Deluxes for their Australian rental fleet, available for hire at over 50 Avis locations in the capital cities and provincial centres. They are the latest end-of-year models with the most recent Australian improvements. A great way for prospective buyers to try a Volkswagen. For other clients with a broken down truck, needing an extra van, moving or going camping, Avis also offer the choice of renting a 'roomy and reliable' VW Kombi Van. 'Without the seats it's the perfect delivery van. With the seats installed there's room for nine people and lots of luggage. What could be better?' Kombis could be rented for 40 shillings a day, plus 1 shiling per mile. VW’s sales drop by 38.1% but they still hold onto third place in the market. 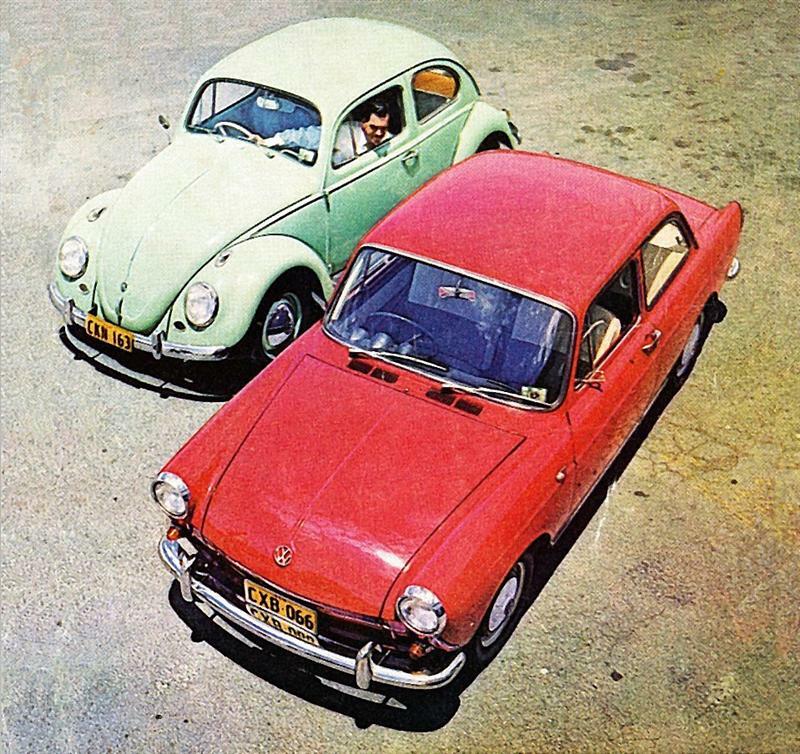 17,803 Volkswagens are sold – 14,970 VW 1200s, 284 Karmann Ghias and 2,549 Transporters. The Australian car market recovers. VW continues to spend £2 million annually on tooling. £20 million has been invested in the Australian plant since 1957. VW’s sales also recover and increase by 40.1%, but due to the success of the new 850 Mini, Morris overtakes VW in market share and VW drops to fourth. VW Australia begins a major export programme, with Australian-made VWs and spare parts shipped to New Zealand, New Guinea, Malaysia, Indonesia, Fiji, Western Samoa and the British Solomon Islands. Australian-made VWs compete with Wolfsburg-built VWs in these countries. Australian VW spare parts are also shipped to New Caledonia, Hong Kong and the Philippines. Volkswagen (Australasia) Pty Ltd displays a number of new adapted versions of the Transporter throughout Australia at the ‘New Horizons in Transportation’ exhibitions, strongly attended by commerce, industry and government. VW displays container vans, bakers’ vans, refrigerated vans and low-loading Pickups. Lanock Motors take over Cleggs Motors (Wollongong) and Edward St Motors (Wagga Wagga), and renames them as Lanock Motors branches. They also purchase 50% of Greg Cusack Ltd (ACT). With 40% of the entire Australian Volkswagen sales, Lanock Motors are the largest independent distributor of motor vehicles in the entire country. After some 16 months without a major upgrade, an upgraded Deluxe Beetle is released in June, officially called the 1962½ model, in order to catch up with many of the European improvements from the previous year. The 1962½ model has sturdy front and rear seat belt anchor points, a spring-loaded front bonnet with the pull release now on the driver's side, door check rods, longer seat runners, sealed tie-rod ends and a redesigned heater system with new rear outlets and sliding front cover plates. Mechanical improvements include a redesigned fuel tank filler, new handbrake and clutch cables, roller steering box, and improved gear linkage to stop jumping out of gear on rough roads. The taillights are now the same familiar 3-segment units fitted to Euro and US-spec Beetles. The price of the Deluxe Beetle remained unchained at £953, including sales tax. VWA releases a new model in August, the 1200 Standard Sedan. It is mechanically identical to the normal Deluxe Beetle except for having no steering damper. It has a simplified, stripped-down interior with no washers, no horn ring, no interior light, no glovebox lid, no fuel gauge, only one sunvisor and only the most rudimentary roof lining and vinyl trim. Outside there is no chrome trim, and the hubcaps and bumpers are painted grey. Volkswagen Australia tries to promote it as the 'Rally Standard', but Aussies nickname it the ‘poverty’ or ‘austerity’ model. It sells for £849, some £105 less than the Deluxe, and was later discounted further to £799. It was popular in country regions and for motor sport, but did not sell as well as the Deluxe. To promote the new VW 1200 Standard, drivers Ray Christie and Joe Dunlop use one to challenge the 13,000 km (most of it still unsealed) Around Australian record, previously set by Evan Green and Jules Feldman in a 6-cylinder Austin Freeway (9 days 12 hours). The smaller but much tougher Volkswagen took more than two days off their record, circling Australia in just 7 days 6 hours. This included an average of 100 km/h between Perth and Ceduna. The 1200 Standard ran on Super Shell with Methyl Benzine, and used Shell X-100 Multigrade oil. Two punctures were their only mishaps, and the car did need some dust blown out of the brake drums in Geraldton. They also used some water - to wash it. On its return, the record-setting Standard was put on display in Lanock Motors' main showroom in William St, Sydney. The last Armstrong 500 at Phillip Island sees a class win in the under £900 Class D to the Volkswagen of George Reynolds and Jim McKeown. This was seventh overall. Another VW (Tony Theiler, Bob Foreman and Reg Lunn) was fourth in class, behind two Mini 850s. A third VW, driven by Doug Whiteford / Lou Molina, did not finish. The race winner was Harry Firth and Bob Jane in a Ford Falcon XL. Due to the rough condition of the track, the race would be permanently moved to Mt Panorama at Bathurst next year. 24,604 Volkswagens are sold – 21,273 VW 1200s, 97 Karmann Ghias and 3,234 Transporters. The Type 3 VW 1500 Sedan and Station Wagon are released on 1st February, Australia being one of the first countries outside of Europe to see the Type 3. For a few months the cars are fully imported, then locally manufactured from July onwards at Clayton after an additional assembly line is established. The Type 3 line merges with the Beetle’s for final inspection. 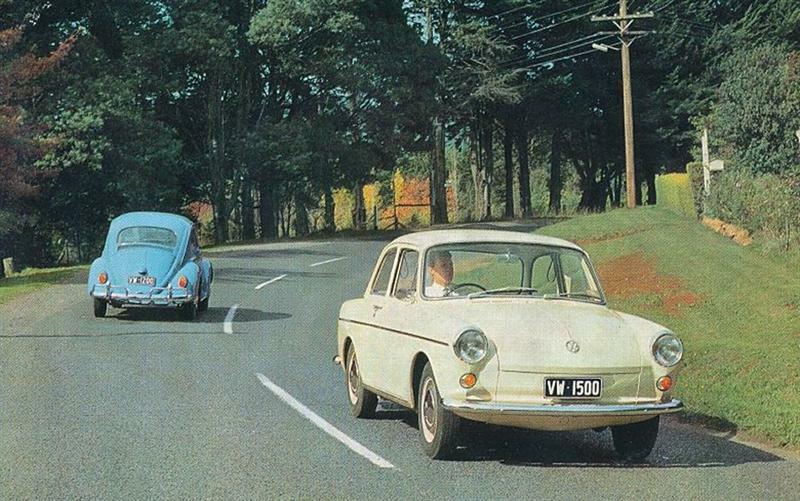 VW Germany provided the production tooling, and Australia is the only country outside Germany to make the Type 3. At £1199 the 1500 Sedan was some £250 more expensive than the Deluxe Beetle. Transporters have their rear cooling louvres moved up high to reduce dust being sucked into the engine bay. Pickups have additional ducting from the front windscreen peak vents. These were Australian-designed modifications that were not used in Europe. 1963 Australian Beetles no longer have the Wolfsburg Crest on the front bonnet, but are otherwise the same as the 1962½ model. In September the purchase price is reduced by up to £54, thanks to production efficiencies and tax savings gained by the increasing local content. Demand for the VW 1200 far exceeds supply. Sales of spare parts and accessories increase almost 40% on 1962. Australian-built CKD kits are now assembled in a factory in Otahuhu, Auckland, owned by the New Zealand VW concessionaires Motor Holdings Ltd. The former Jowett dealer began assembling German VW CKD kits in 1955, but soon began importing Australian parts. Now they assemble Australian kits at the rate of 35 per day. They also place Clayton’s largest single export order to date – for 1,000 complete Australian VW 1200 Deluxe sedans. 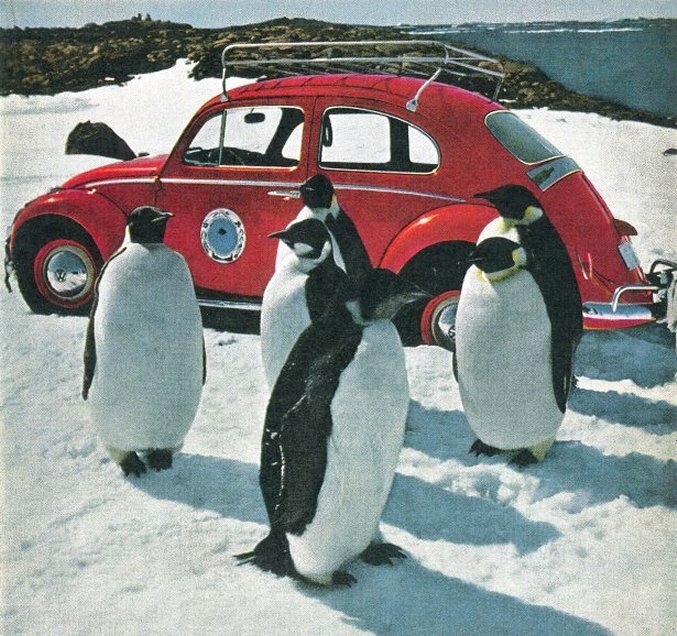 ANARE ships a ruby-red 1962½ Beetle to Australia’s Antarctic base at Mawson, the first-ever production car on the frozen continent. It was chosen by ANARE team leader Ray McMahon, who thought the air-cooled, rear-engine Volkswagen would be ideal in the conditions. The otherwise standard VW is given a thorough Scandinavian ‘winterising’ treatment at the Clayton factory, then shipped to Mawson on the Nella Dan. ‘Antarctica 1’ serves the Australian scientists for a year, surviving smothering snows, rough ice fields, knifing 200 km/h winds and the bitter cold of an Antarctic winter. The Australian scientists proudly call it the ‘Red Terror’, and it features in world-wide Volkswagen promotion and advertising. The Armstrong 500 production car race is moved from Phillip Island to the spectacular Mt Panorama circuit at Bathurst. The race sees 58 entries across four price categories, including five Volkswagens in the under £900 Class A. Bob Jane in a Cortina GT won the event, but everyone remembers the all-day duel between Barry Ferguson / Bill Ford in the VW and Don Holland / Lindsay Little in the Mini 850. The lead changes dozens of times. Finally on the last lap the Mini overturned at Murray’s Corner, and the VW went on to win Class A (and 19th overall) with 116 laps completed. 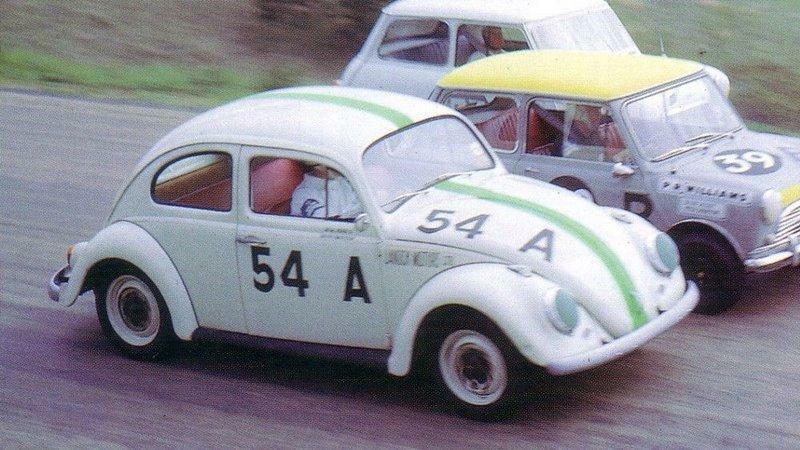 The VW of George Reynolds / Jim McKeown finished 3rd behind the righted Mini; the VW of Art Andrews / Rocky Tresise was 4th, and the VW of Greg Mackie / Graham White was 5th. The Frank Hann / Graham Forrest VW was 8th in class. All VWs finished, while five Minis (four of them Coopers in Class B) expired. 27,068 Volkswagens are sold – 20,135 VW 1200s, 2,444 VW 1500s, 81 Karmann Ghias and 4,408 Transporters. Volkswagen (Australasia) Pty Ltd becomes fully German-owned when the Volkswagenwerk buys up the 49% that had been Australian-owned. The company therefore changes its name to Volkswagen Australasia Ltd, showing it is now a public company. A new £25 million 3-year expansion program is begun to give Clayton an engine manufacturing plant, non-ferrous foundry and transmission plant. This includes building the 37,000 sq metre Hall 2 alongside the existing factory (Hall 1). It would be the most modern car plant in the Southern Hemisphere. Local content is planned to increase from 75% to 95%, for both the Beetle and Type 3. Detail changes only. The Beetle got a wider rear number plate light and wider front blinkers, while the ’63 chrome horn ring remained (unlike Euro-spec cars). The VW 1500 received trim changes and a lower sales price (up to £100 off), thanks to local manufacturing efficiencies. The Transporter is upgraded to a 1500cc engine. ‘Antarctica 1’ returns to Australia and is replaced at Mawson by ‘Antarctica 2’, in International Orange. Antarctica 1 goes on a VW dealer promotional tour, and then is given to drivers Ray Christie and Joe Dunlop. They enter the ruby-red VW in the 3,500 km 1964 BP Rally, against 42 other cars of all makes and models, including a dozen other VWs. Almost unbelievably, wearing number 32 and still carrying its ‘Antarctica 1’ plate, it wins the event outright. For the full story on the Antarctic VWs, from 1963 to 1970 and beyond, see the Antarctic VWs page. Ray Christie and Joe Dunlop further promote the VW name when they set out to break their 1962 around-Australia record. This time they use a VW 1500 sedan. They depart Melbourne’s Southern Cross Hotel at 12:01am on 23 August, and arrive back at 10:18pm on 28 August. 12,950.8 km in 5 days, 22 hours 17 minutes; average 91.0 km/h. This is still the ‘unofficial official’ around-Australia record today, as public road racing of this sort was banned soon after and it is now illegal. The big reliability trial idea is revived with the 1964 Ampol Trial, although it was confined to the east coast states only. There were 31 Holdens, 29 Volkswagens, 23 Fords, 10 Minis, 8 Valiants and 45 other cars competing in the fast 11,200 km trial. Lanock Motors entered two new VW 1500s, driven by Doug Stewart and Barry Lloyd, and Barry Ferguson and Tony Denham. This time Beetles were outclassed, with the best finishing in 13th place outright (but first to eighth in Class B). The winner was Harry Firth’s Cortina GT, 4 points ahead of the Ferguson/Denham VW 1500, then a Holden, then another VW 1500. 21 of the 29 VWs finished, with the 1500s in 2nd, 4th and 14th, so VW won the Teams Prize. Beetles are also outclassed in the Bathurst Armstrong 500. Vauxhall Vivas take the first six places in the under £900 Class A, with the VW of David Walker / Brian Milton 7th (112 laps). The VWs of Bernie Haehnle / Neil McKay are 11th, Bill Ford / Barry Ferguson are 12th and Frank Hann / Graham Forrest are 15th. However they did beat the sole surviving Mini 850 – the other three all expire. This was the last time VW Beetles raced at Bathurst. The race is won overall by Bob Jane / George Reynolds in a Cortina GT – Bob Jane’s fourth win in a row and first for the (usually) VW-driving George Reynolds. Volkswagen Australasia Ltd records its greatest-ever annual turnover (£27.37 million), and its greatest-ever trading profit (£989,327), on an all-time production record of 34,588 vehicles (including export). Employment increases by 21% over 1963, to an all-time record of 2,307 people. LNC Industries also record their biggest profit to date, £329,969, but Lanock Motors are now only one of seven subsidiary companies. The 200,000th Australian VW is produced in November, a white Beetle that was donated to the Australian Red Cross. 31,419 Volkswagens are sold – 22,293 VW 1200s, 3,443 VW 1500s, 28 Karmann Ghias and 5,655 Transporters. This would be VW’s best-ever year in Australia record for another 46 years.